If you’re a business with fewer than 50 employees, providing small business health insurance to your staff is optional. There are many small business health insurance options available if you choose to offer it to attract new employees and to keep your current ones happy. However, if you have over 50 full-time employees, you are required by law to offer health insurance and you must provide proof of that to the IRS. We’ll show you how to provide small business health insurance to your employees, what it costs, how to maximize your tax savings, and other best practices. At the end of the article we’ll also explain some of the confusing jargon and answer some of the more common questions you may have. Confused about your health insurance options? With Premier Insurance you can compare different plans from leading carriers and see which one is right for your company’s budget and coverage needs. There are many variables that affect health care costs. 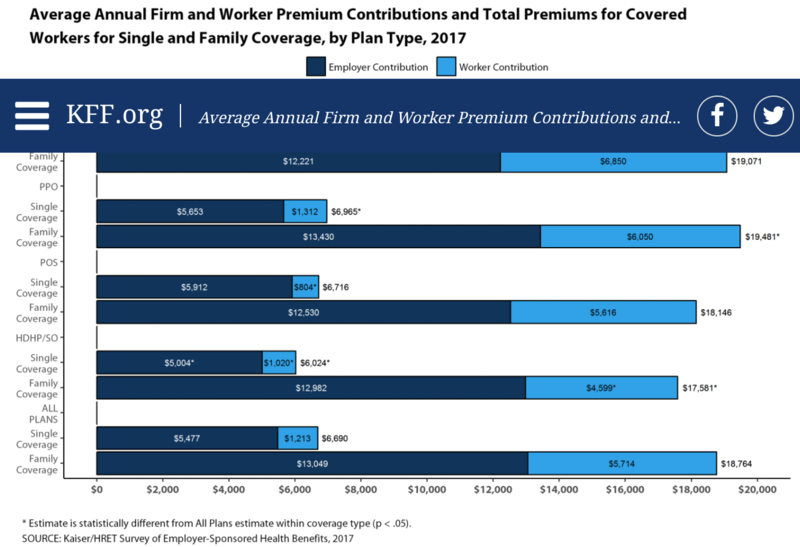 This chart from the Kaiser Foundation provides overall averages and shows that coverage for an employee can cost close to $600 per month, whereas the cost for family coverage is closer to $1,500 per month (premiums shown shown below are annual). Only after you choose the provider and coverage types is it possible to estimate your specific business’ health care costs, which we cover later in this article. There are tens of thousands of health care plans available to small businesses. Because these plans vary so widely by state, there’s no one plan we can recommend for all businesses. What we can do is tell you about the types of organizations that can provide your small business with health insurance plans, then we’ll clarify the types of health plans each type of organization might offer. Businesses with fewer than 50 full-time employees (FTEs) are not required to provide health insurance for their employees. If your business has 50 or more FTEs, the ACA (aka Obamacare) requires you to provide health insurance for your employees or pay a penalty when you file your taxes. The rest of this article will focus on how. Disclaimer: Please note that this article contains general information only, so please consult your own legal, HR, or insurance professional before making any decisions about whether and what type of health insurance to provide. Small businesses have three primary options for a partner in providing health insurance: licensed insurance agent or broker, a Professional Employer Organization, and the SHOP marketplace. Here’s a table with information explaining the pros and cons of each. Insurance broker Also known as health insurance agents, brokers provide a direct link to health insurance companies and/or to the government marketplace. Cost vary widely. Count on paying a premium for having an agent service your company’s health insurance accounts. Direct help; face-to-face meetings; can do enrollment presentations for employees. Low or no commissions may mean overworked brokers who may take on too many clients. Make sure your broker can give you the attention you need. Professional Employer Organization (PEO) A PEO lets you outsource employee management tasks, such as providing employee benefits. Costs ≃ 2% of an employee’s salary. Compare cost in our article on thebest PEOs for small business. Reputable; can serve business in several other areas like HR and payroll; guaranteed ?IRS compliance. Online -- less personal contact; requires web sign ups for employees, which may confuse them. Workers Compensation and Liability issues can arise. Unfortunately there is no one answer as to which option is going to be best for everyone. Not only can the pros and cons vary by state, but your options and costs will vary based on your exact geographic location, the plans you offer, and the amount you choose to contribute to help employees pay for their coverage. For example, if you’re located in a major city then you’ll likely have greater access to a selection of brokers. However, it may require a Yelp search or tapping into your personal network to find a good one. Try getting recommendations from your contacts on Facebook or LinkedIn — you’ll be surprised by what your network knows. Conversely, if you’re located in a smaller town, you may be limited to a single broker so searching for online benefit providers might give you more choices. Once you have a few ideas for who you might want to work with, schedule an initial meeting or call to learn more about the benefits, products, and services that they offer, such as do they offer health reimbursement or savings accounts in addition to insurance. It’s wise to get a quote from multiple insurance carriers. Why? Because insurance offerings vary greatly by state and even by city. All brokers get the exact same rates for quoted plans. Having an experienced Agent will assure you get quotes for all available products that make sense for your business. The number of employees you have that might participate also affects cost. And some locations have few providers available, driving costs up. Comparing all of these options will take a while, of course. Make it easy on yourself by hiring and experienced Agent. You won’t spend any extra money, but you’ll save a lot of time. Willingness to help — for example, do they manage open enrollment paperwork? Have a website for employees to sign up? Answer employee questions about plan options and coverage? Accessibility — will you have a dedicated rep or do you get the feeling they’ll disappear once the contract is signed? What support can you expect from the company? Website reliability and data integrity — do you see any complaints online about the company? Do the online reviews concern you? Remember, cost is only one aspect. Did you get a quick and friendly response when receiving your quote or was it a hard sell? Did you have to wait a week? Keep in mind that this is the “wooing” phase. If you don’t like their customer service now, you certainly won’t like it when there is a problem that you need resolved. Neither will your employees. How many of those employees do you think will participate in the insurance plan? How much are you looking to spend per employee? Are you planning to contribute any business funds to help employees purchase their insurance? This information is needed by the vendor to figure out the best ACA-compliant options for your business and to be able to present those choices and costs to you. Now that you know who you might buy from, let’s talk about what you might buy — as in, what kinds of health plans to get quotes on. No matter who you work with to get health insurance for your employees, the organization should have access to various types of health insurance plans and the actual insurance companies who provide those plans. There are four main types of health insurance plans: health maintenance organizations (HMO), high deductible health plans (HDHP), point of service plans (POS), and preferred provider organizations (PPO). The service provider you choose will help you identify which of these is best for your organization based on your budget, number of full-time employees, and life stages of your employees. For example, older employees may want to stay with their existing medical provider, while younger employees may prefer to save on co-pays instead. Of course, employees have the option to purchase these kinds of plans on their own through the exchange or a private health insurance company; but it’s often cost prohibitive, especially for families and older workers. Providing healthcare plans through your business allows you to offer group plan rates that are more affordable for employees. Typically you as the employer will also have the option to enroll in the plans you provide to employees. Health Maintenance Organization (HMO) An insurance plan that limits where a person can get care. The employee’s medical provider must be in-network for the employee to receive benefits. Employees may need a referral for specialists like an orthopedic doctor. However, once they find a doctor in-network, co-pays are low or even $0.HMO plansmay offer the lowest premiums. High Deductible Health Plan (HDHP) A health insurance plan with a large deductible. AnHDHPis a medical plan with high out of pocket costs (high deductible). It’s often paired with a tax-free savings option such as anHealth Savings Account (HSA). This type of plan offers lower premiums than a traditional POS or PPO. One of the benefits is that it’s easy to use and the employee can often keep their own doctor. Point of Service Plan (POS) A health insurance plan with a choice. This type of plan allows the insured employee to use an in-network provider or get a referral prior to treatment.POS planshave reasonable premiums, provide decent coverage, and are easier to use than an HMO. The employee will have some out of pocket costs, such as a deductible and/or co-pay. Preferred Provider Organization (PPO) A health insurance plan with, usually, a very expansive network.PPOsoffer a large list of practitioners and no referrals are required. This type of plan is going to have the highest premiums but also the best coverage. It’s also easy for employees to use. Like a POS, the insured will still have a deductible, co-pay, or both depending on the treatment. Please note that the following three options are not traditional health insurance plans like those listed above. They don’t meet ACA requirements by themselves. Instead, these are value-added health benefit savings accounts that allow employees use pre-tax dollars to pay for their health expenses. Employers often make these available in conjunction with one of the traditional health plans mentioned above. All but an HSA can also be offered as a stand alone option if you have under 50 employees and can’t afford or don’t want to offer traditional health insurance. Flexible Spending Account (FSA) Employer-sponsored tax advantaged account.An FSA is a pre-tax savings account that employees can use to pay for medical expenses. An FSA doesn’t roll over from year to year, so it’s a use it or lose it system, and employees should be reminded to use their dollars regularly to avoid losing them. It’s a good option if you have fewer than 50 FTEs, and want to help employees use pre-tax dollars to pay their health care. An FSA is owned by the employer. Health Savings Account (HSA) Ahealth savings account. An HSA is a another kind of pre-tax savings account, but it’s only available if it’s paired with an HDHP. This plan operates like a 401K for health savings: an employee can contribute, an employer can match it, and the employee can use it to pay health care costs and deductibles. An HSA is owned by the employee, so it stays with them even if they change jobs. Health Reimbursement Account (HRA) Employer-funded and maintained account.An HRA is an account that allows employees to be reimbursed for medical expenses by submitting receipts. However, it’s a murky area regarding medical privacy because it can lead to privacy problems and even cause discrimination -- for example,if you skipped over someone for a promotion because you knew they were ill with cancer. An HRA is a good option if it’s administered by an outside broker or aHIPAA-certified HR Manager. Read our article onFederal Labor Laws to learn more about HIPAA. You may be wondering how to build the best small business health insurance plan for your employees with so many choices available. After you work out your budget with your chosen health care plan provider — broker, PEO, or SHOP agent — you can narrow down what you are going to offer to employees. It’s not a bad idea to also ask your employees for feedback on what kinds of plans or plan combinations might be most helpful to them. An HSA and an HDHP. This health insurance combination would be good if you want to offer something, but don’t have a lot of money to offset the premium costs for employees. HSA premiums are lower than other health plan types, and your employees could save pre-tax dollars to help pay their deductibles and co-pays. A PPO and an HMO. Allow employees to choose which is best for their family. These are two good options if you have an employee base that has multiple generations and spans multiple concerns (for example, some have families and others are millenials who rarely see a doctor). It also gives the employee choices on the coverage they want and how much they want to pay. Read our article on HMO vs PPO to learn more. A PPO, an HMO, and an FSA. Adding on an FSA is a nice value-add if you have employees who want to plan for just-in-case. FSA savings are pre-tax dollars they set aside to spend each year, and anything they over $500 they don’t use after year end, rolls over to you, the employer. An HDHP, an HMO or POS, a PPO, and an FSA or HSA. This would be a more comprehensive offering so that you really empower your employees to choose their own health insurance based on their budget and family needs. If you want to offer a broad range of choices like this, a PEO is going to be your best provider option. They have more options and can negotiate lower costs with health care providers thanks to the power of numbers. Am I Required to Pay for the Health Insurance If I Offer It? Employers are generally required to cover 50% of the employee cost of the lowest cost plan option. There are times when this requirement can be waived. However, employers with 50 or more employees that are required to offer business health insurance, must offer health insurance that is affordable. This means that the cost to the employee must be less than 9.6 percent of the full time employees’ salary. Employers, 50 or over, that don’t provide affordable insurance may be subject to penalties. This is part of the employer mandate under the ACA. When you give employees additional money, such as a pay increase or bonus, they pay income tax on that money. However, if you provide small business health insurance, employees don’t have to pay income taxes on the portion of the premiums that they pay using pre-tax dollars. Health care benefits are considered pre-tax deductions from the employee’s paycheck. Employees need health insurance, period. The ACA makes it illegal for individuals to go uninsured, so it’s likely that most of your employees are looking for an employer-provided health plan whether through your business or the company their spouse works for. Health benefits are one of the most sought after employee benefits according to our article on 2018 workplace trends. Providing benefits such as health insurance is a key part of building a positive employer brand. As your business grows, your staff’s personal needs may change — they age, get married, have children, or perhaps encounter health issues. Offering health insurance makes it more likely that these employees will stay with you for the long term saving you in recruitment costs, employee turnover, and the time it takes to onboard replacement employees. When you offer health insurance to your employees, you have the option of purchasing it for yourself and your eligible dependents as well. If you are older than 40, group plan pricing can save you thousands off your health insurance costs versus purchasing health insurance from an agent or on your own in the marketplace. The percentage of the premium you’ll cover or amount of money that you give to employees to help them purchase coverage. The exact type of health benefits you provide – this can range from just providing a health savings account at no cost to you, all the way up to providing an employer-sponsored health care plan in which you cover all employee premiums. Who you are going to cover – is it just the employee, employee and spouse, employee and dependents, or full family coverage? Are part-time employees eligible for health insurance or only full-time staff? Are you going to enroll in the plan yourself as well? A flat amount each month, such as $500 per employee, that they can use towards any employee benefits provided like health insurance, retirement plan, disability insurance, etc. In general, a flat amount per month is the best practice since it’s easy to budget for and makes the most sense in term of fairness for your employees. You decide to cover 50% of the premium for the employee only (no spouses or dependents). That makes your cost $175 per month or $2,100 per year per employee. You decide to give each employee up to $400 per month to use only for health insurance. That makes your cost $400 per month (or less) or $4,800 per year (or less) per employee. The type of health insurance benefits you provide will affect your cost, unless you are doing a set amount per month per employee. Let’s look at an example of some typical cost-ranges for health insurance premiums by type based on 2017 data. Health care costs have been going about about 3-4% a year according to factcheck.org. Of course, these premiums can be higher or lower, depending on several factors that are unique to your group. Keep in mind that premiums also vary greatly by state. For example, Alaska pays almost 76% more in premiums than New Mexico, which pays below the national average. Additional cost information can be found in our article on health care costs. If you would like to cover a percentage of the employee’s premiums, we would advise you to crunch the numbers considering your location and the number of employees who will be participating. You may be thinking that of course you’ll provide health insurance or contribute towards the cost for your full time employees, but will you also supplement the costs for their families or dependents, such as spouses and children? Will you offer benefits to part time employees? Or only to those full time employees who work 35-40 hours or more a week? If you offer a flat amount, then you don’t need to make that decision – the employee can just use that flat amount for whatever health care coverage they want. However, if you cover a percentage of the premium, then your cost will go up or down depending on how many people are covered. Young and unmarried with no kids? They’ll need single coverage. Married with children? They’ll need family coverage. Single with children? They’ll need coverage that allows them to add dependents. Older and using Medicare? They may only need an FSA, not health insurance. A mix of many phases of life? You may need to provide multiple options. When considering whether to cover just employees or to cover their spouses and dependents as well, you’ll obviously need to think about your budget but also the changing needs of your business. Many of your younger unmarried employees may get married and have children sometime in the future. They’ll then need to add spouses and dependents onto their health insurance plans. Here are answers to a few of the most common questions you may have about offering health insurance to your employees. Where Can I Find More Information on Providing Healthcare? If you are interested in reading a comprehensive guide on the ACA, which regulates how businesses provide health insurance, read this guide from the DOL. The IRS provides a simpler document if you just want the basics laid out. Why Shouldn’t I Work with an Insurance Company Directly? Unfortunately, working directly with an insurance company is not an affordable option for small business health insurance due to so few employees. However, if you work with a broker, or PEO agent you’ll likely be able to get insurance through one of the big carriers like Blue Cross / Blue Shield, Aetna, or United Healthcare at a group rate. What about New Hires? Do I Have to Provide Insurance Right Away? Under the ACA, if you offer health insurance to your employees, you must offer it to all eligible employees within 90 days of their employment start date. This is regardless of company size. So even if you have fewer than 50 people working for you, if you offer small business health insurance at all, you need to make it available to new hires within 90 days. Are there State Laws Besides the ACA? States have the ability to expand upon the ACA and place additional requirements on health insurance. The only changes we’ve seen are some states that mandate specific coverages, such as for contraceptives to be included as part of their health care plans. Florida does have some conflicting rules, so again, hiring an experienced Agent is the best bet! Besides Health Insurance, What Other Insurance Do I Need to Provide? Most small businesses in the US must have unemployment and workers’ compensation insurance. Five states require employers to provide disability insurance: California, Hawaii, New Jersey, New York, and Rhode Island. You can learn more about state-specific small business insurance requirements on the SBA website. Affordable Care Act (ACA) or “Obamacare” Passed in March 2010, it is asweeping healthcare reform bill. Affordable Coverage Insurance provided needs to cost less than9.5% of the employee’s household income.Your broker, PEO, and SHOP can help you make sure your choices are compliant. Applicable Large Employers (ALEs) Employers with over 50 FTEs required to provide health insurance per the ACA. COBRA Federal lawthat lets employees keep their health insurance benefits after termination or layoff for a certain amount of time, but employees have to pay 100% of the premium costs. If you provide insurance, you must provideCOBRApaperwork upon termination. Employer Shared Responsibility Payment (ESRP) This is essentiallythe termused to describe employers with 50+ FTEs and their compliance with ACA. Flexible Benefits Plan (aka Section 125 Cafeteria Plan) This kind of plan allows employees to pick from a “menu” of benefits, like health insurance, life insurance, etc. Learn more by reading our article onSection 125 Cafeteria plans. Fully-Insured Job-Based Plan A health plan purchased by an employer from an insurance company. Grandfathered Health Plan A healthcare plan created before March 23rd, 2010.These plans still must overcome certain hurdles to be compliant. Open Enrollment (OE) Period Thegeneral time framewhen an employee can apply for insurance coverage. Your broker or PEO can help with annual OE dates. Qualified Health Plan AQualified Health Planmeans it is ACA compliant. It is also referred to as a plan that provides minimum essential coverage. Summary of Benefits & Coverage You must provideeasy to read summariesof the health insurance plans and options you offer to your employees. Your broker or PEO will most likely provide these documents for you or help you create them. If finding benefits for your employees still feels overwhelming, take a deep breath. Then click here to contact us, and we can run the comparisons for you, absolutely free.